‘What is the what’ is the title of the latest book by writer Dave Eggers. The book has inspired me to learn more about the current situation in Sudan and Darfur. I sincerely hope that many will also read this book and will be inspired to take action or to speak up. Everyone knows something is very wrong in Darfur, but the exact details are unclear for many. Until I read ‘What is the what’, the autobiography of Valentino Achak Deng, written down in novelized form by Dave Eggers, I also understood little about the situation in Sudan. Despite the fact that ‘What is the what’ is not about the Darfur region, but about the war that raged in Southern Sudan the past 20 years, the events in both areas basically share the same causes. In many ways history is repeating itself in Darfur. ‘What is the what’ is the unbelievable story of the life of Valentino Achak Deng, a former ‘Lost Boy’, like the drifting children were called in the Sudanese war. The novel describes the true story of the horrendous ordeals the young Valentino is confronted with when he escapes from his village which is torched by the murderous Murahaleen militia. From that moment he is a running five-year old, unknowing of the fate of his family. With a group of hundreds of other Lost Boys, he undertakes an epic journey of years through the desert, to eventually end up in the enormous Kakuma refugee camp in Northern Kenia. What makes the book remarkable in my opinion (apart from the extraordinary challenges that Valentino has to face), is that the story does not contain any moral indignation, something you would expect considering the events described. You listen to a voice of someone who experiences all cruelties he is seeing and living through as a given. Because the reader experiences the events through the eyes of growing up Valentino, he/she realizes it is not just misery, but also simply the life of someone (and many like him) who tries to make the best of the situation, also in the most gruelling circumstances. The rapes and killings by the militias that caused hundreds of thousands of victims. The situation of millions of people who fled the violence and ended up in enormous refugee camps, living in very poor circumstances. The role of the cunning dictatorial regime in Khartoum, that buys weapons and high-tech attack helicopters to use against its own people. The feared Janjaweed militia, supported by the regime, who come on horseback, burn villages to the ground and murder and abuse all inhabitants. The genocide and ethnic cleansing that is taking place and the role of the regime in playing the different tribes off against each other. The rebel armies, mostly consisting of boy- and teen soldiers, who revolted against the government, but became so divided themselves that with the wars among each other they only contribute to the violence and chaos. The fact that international relief organisations can hardly do their work because they are worked against by the regime and their supplies and vehicles are robbed by the rebels. Endless bureaucratic procedures preventing journalists from getting the proper documents to enter Darfur. In a lot of countries there seems to be an revival of attention for the situation in Darfur. Many are wondering why there is no intervention by the United Nations, why there are no sanctions against the regime. The roles of China (with its huge interest in the oil reserves of Sudan), Russia (as an arms supplier to the government) and the United States (who work together with the Sudanese government in the war on terrorism because of the presence of Al Qaida in Sudan) all certainly have to do with it and prevent that serious international intervention is taking place. The UN envoy, dutchman Jan Pronk, was expelled from Sudan after he criticized the regime. There is going to be a UN peace army of 20.000 troups, replacing the African peace mission that failed due to lack of funds, proper mandate and organisation. Of course the presence of UN soldiers for protection of the people is a good thing, but probably only a drop of water in the Sudanese desert, considering the scale of the country and its conflicts. A lot of people have had enough of the passive attitude of their political leaders. Voices are heard to use the coming Olympics in China to bring the attention of the world to the problems in Darfur. One of those voices is actrice Mia Farrow. She had the idea to rename the China Olympics to the ‘Genocide Olympics’ and to persuade athletes to wear t-shirts with ‘Team Genocide’ on it. In this way she hopes to draw attention the the role of China in the genocide in Darfur. She wrote an open letter to Steven Spielberg, who is the artistic director of the Games. He was not aware of the link between China and Darfur, was shocked and spoke to the president of China. 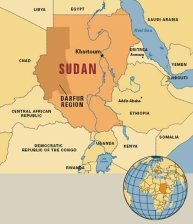 China promptly sent a special envoy to Sudan. Needless to say, China is not very happy with this kind of attention for their Olympics. In the Netherlands, this week the campaign ‘Sofar Darfur’ took place, meant to bring new attention to Darfur, seemingly forgotten by the public. I really hope this helps, and that political leaders finally see that this cannot continue, that something needs to be done to stop the genocide. Last but not least the website of Valentino Deng Achak. After he ended up in the United States together with a lot of other former Lost Boys, he founded the Valentino Deng Achak Foundation. The aim of this foundation is to raise funds for his home town Marial Bai, the development of Southern Sudan and Darfur. Take a look at his website, where amongst a lot of interesting stories, you can read an inspiring essay of Dave Eggers, about the writing of ‘What is the what’. All proceeds of the book are going to the Valentino Achak Deng Foundation.